I've been on a quest for quite some time to remove as many chemicals as possible from my life. That sounds totally intimidating and like a lot of work, but it's really been quite easy. There are tons of arguments for and against a more natural approach to skincare, some think the chemicals we put on our faces are the worst, others don't think it's a big deal. However, I know that the fewer chemicals I eat the better I feel, so why shouldn't that apply to what I put on my skin as well? First I tried to find better alternatives to the products I already used (here is a list of ingredients to avoid in your skincare products, and here's another) but that got time consuming and expensive. Then I found something called oil cleansing and I stopped washing my face completely. Oil cleaning uses oil (duh!) to dissolve the dirt and grime on your face without disrupting the natural balance of your skin. This is just another example of where modern science has upset the natural balance of our bodies making us have problems we don't need to have! Your skin needs oil. It protects it and keeps it moisturized. So stripping away all the natural oils with soap and other chemicals generally makes skin problems worse! Remember back to high school chemistry? Like dissolves like! By using the right oils you can dissolve the dirt and unhelpful bacteria from your face and replace the dirty oil with ones that will help nourish and protect your skin! You might think that if you have oily skin, oil cleansing can't possibly work for you. But it can! No matter what kind of skin you have, you'll likely experience an adjustment period of a week or two as your skin adjusts to this new method of cleansing. It will be so easy to want to quit during that time. I mean, who wants to relive their high school years through their skin?!? But if you stick with it you'll be rewarded with happy skin that requires almost no work and very few products! In order to get started with oil cleansing you'll need just a couple of things: oil, warm water, and a washcloth. You can make your own blend of oils (I suggest Google if you are going that route) or you can buy some premixed oils (more on that in a minute). I use about a dime sized amount of oil. I pour it onto my fingers and then massage it into my face. You want to massage it for a minute or two (two is better) until it has saturated your skin. Then take a washcloth and run it under very warm water (or you can stand in the shower for a few minutes) and wring it out. Hold the cloth over your face until it cools. Then gently wipe the oil from your face. Yep, that's it! There will be a very light layer of oil left on your face but that's the best part. Because you aren't stripping your face of it's natural moisturizers you probably won't need to moisturize your face! How great is that?!? Ok, now for the products I use. 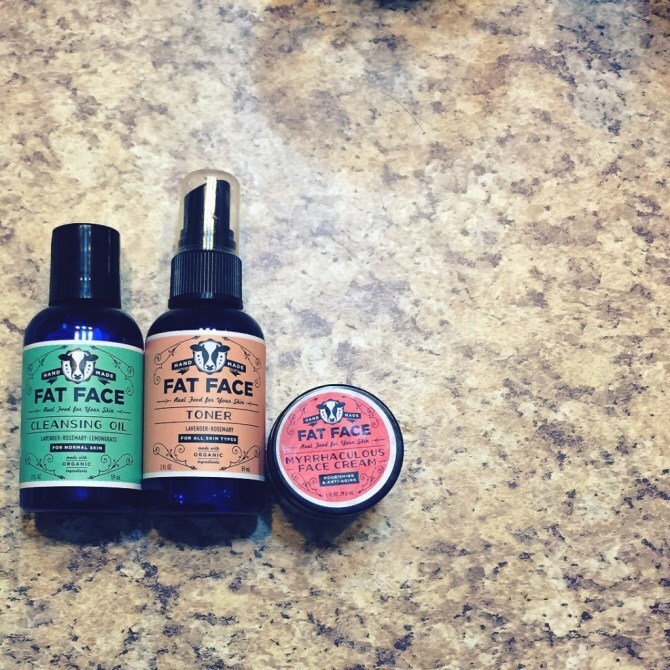 I found a brand called FatFace Skincare. They have tons of great products. I use their cleansing oil for normal/combination skin, the toner, and the Myrrhaculous face cream (I only use the face cream about once a week). I use the toner because switching off of hormonal birth control my face has been angry. The toner seems to help keep it in line a bit better. FatFace uses organic and natural ingredients. They use plant based fats as well as tallow from pastured, grass-fed cows. I seriously can't say enough good things about this company. They make small batches of this stuff so it's all essentially homemade. The shipping is cheap and fast and the customer service is amazing! Fat is my friend AND I use it on my face! !